A detailed look at the new 2014 IS250 and IS350 sport sedans. Seven years since the last redesign of Lexus' BMW 3-Series competitor, and almost every part of the car is new. Today Lexus released details of the 2014 IS line of cars including the IS350 and IS250 sport sedans. Previously, Lexus had announced some details on the IS350 F Sport variant and also given some facts on the hybrid version of the car, which will Lexus says will not be sold in the US. The details today reveal two basic sedans in three variations each. The new 2014 Lexus IS350 and IS250 have a three inch longer wheelbase and are about a half inch wider. This will translate to a much more usable rear seat. The main competitors for the car are the BMW 328i and 335i, the Infiniti Q50 (formerly known as the G37) and the Cadillac ATS. The ATS will now stick out as having the least usable rear seat of the group. In addition to lengthening the car, Lexus claims that through new welding and bonding techniques, and simply employing more welds overall, the car is now significantly more rigid. Changes to the front suspension also contribute to less sway and more rigidity. The upshot of this is the car will handle much better. The design is most changed in the front and rear. Up front the spindle grill is the most dramatic of the Lexus cars it has been applied to. In back the poor rear styling is now fixed and looks more like the GS. Changes to the rear suspension improve handling and also make the trunk larger. The IS250 and IS350 come three ways. First, each comes standard as a rear drive, 2 door sedan. Each can also be chosen as all-wheel-drive. Finally, both the IS250 and the IS350 can be given the F-SPORT treatment. Previously, one could order F-SPORT components and in certain model years the more powerful IS350 could be designated F-SPORT. Lexus has dropped the 8-cylinder, much different IS-F sports sedan and thus the new F-SPORT versions of these cars carry the ultimate performance set-up now for Lexus. Unless you count the larger, but not faster LS460 F-SPORT. Thus, there are 6 distinct cars in the IS line-up for 2014. Lexus has been mum on whether the IS350C and IS250C 2-door, hardtop convertibles will make an appearance later. Our guess is that with the cars getting longer the answer is, sadly, not likely. However, Lexus did introduce the IS250 and IS350 as all-new models in 2006, and then waited until late 2009 to introduce the 2010 “C” convertible variants. So there is some glimmer of hope. Having dropped the convertible IS cars, Toyota and all of its brands are no longer offering any convertibles. The Solara went away, and now the IS. A Scion FR-S convertible may soon come, but as of now, it is not an official model. Both engines found in the 2014 Lexus IS line are carry-overs. The IS250 has a 2.5 liter V6 with just 204 horsepower. This is not a quick car. When configured as an AWD sedan as most of the cars built for inventory are, the car is even slower given the added weight of the front wheel drive addition. However, the model is very popular and outsells the IS350. The IS250 has a 6 speed automatic transmission. It used to theoretically be available with a stick shift, and auto writers always mentioned that, but neither they, nor customers ever bought any, so it has been put to rest. The IS350 has a capable 306 horsepower V6 that has both port and direct fuel injection. The two fuel injection systems work together to offer the best fuel efficiency and power. In a car this size, and costing nearly $55,000 with popular options, this power level is expected. It does not stand out, but it certainly is class competitive. The biggest drivetrain change is the transmission in the 2014 IS350. It is moving to an 8-speed automatic. This new transmission comes from the outgoing IS-F. Although it is not a dual clutch auto, which would be the best type of transmission for such a car, it is second best. This transmission has enough gear ratios to offer great acceleration, great fuel economy, and it will give sales associates something to talk about in the showroom. In terms of performance the transmission has a G force sensor that notes when to shift down or up. The idea is that this makes the car sportier during spirited driving. We have driven the transmission in the outgoing IS-F and didn’t notice the effect on back roads. The transmission also has less slip than typical torque converter transmissions which Lexus says makes the car both faster and also more fuel efficient. Paddle shifters are on all models. IS250 and IS350 vehicles equipped with all-wheel-drive will be able to shift up to 70 percent of the power to the rear wheels. Like the Infiniti system, the Lexus AWD gear is adapting a rear-wheel-drive car to AWD. Thus, it can still work well as a rear-biased system. In slippery conditions like starting out on snow or uphill on snow, the system can become 50-50 front/rear powered. The 2014 Lexus IS250 and IS350 will come with a variety of drive modes. All models come with ECO, Normal, and SPORT modes. Changing the modes changes the vehicle character a bit. ECO is what you think it is, Normal, is what you think it is, and in SPORT the car get slightly sharper handling and slightly different throttle and shift programming. The outgoing car had a SPORT button and it is indeed a big difference when selected. We expect these new modes to be even more distinctive. The IS350 F-SPORT gets a fourth even more aggressive mode called Sport+. Wisely, Lexus has opted to add a SNOW mode to the AWD cars in addition to the other 3 modes. This works well in use and is as simple as locking out first gear to allow the car start in second gear. This is a Toyota trait that works well and we are glad to see it continuing in the newest Lexus cars. It would be nice to see this mode on all the IS cars since they might all see snow and it is simple to implement on any car. Drivers of Lexus IS cars will be very surprised just how different the 2014 IS250 and IS350 are from past cars. The outgoing IS was introduced in 2006. Seven years is not only a dog year, it is a lifetime in terms of car design. Although still very much Lexus, the new interior is “new-Lexus.” The infotainment screen is a pop up from the dash type like the Lexus CT has. The controller for the infotainment screen is now moving away from touch screen to the much-loved Lexus Remote Touch Interface (RTI). The RTI works as well as any in the business and rivals BMW’s excellent design. Although Lexus says there are non-navigation cars, we haven’t seen one in a dealer showroom, so most built will have the NAV set-up. Climate control switches are now electrostatic. Let’s say a quick thank-you to the Lexus engineers and designers for making them available at all, instead of having to use the menus on the infotainment screen to adjust temperature. Materials and styling are all improved, but the biggest stand-out is on the F-SPORT variants. They get a single round gauge that has a moving ring. Taken from the LFA supercar, the design is excellent and it is a shame it isn’t on all the IS variants. 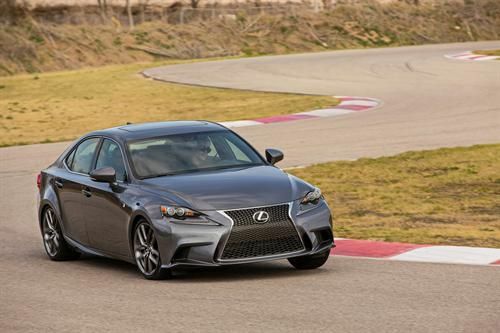 The 2014 Lexus IS250 and IS 350 will both see significant new safety systems available. A pre-emptive pre-collision system which works with the adaptive cruise control radar is now available. Blind spot monitoring and Lane Departure Alert are also now available. Also available is Lexus’ premium Mark Levinson Sound system. As rare as a baby pigeon in dealer showrooms due to its high added cost, this sound system is so good that you should decide first if you can afford it before hearing it. It spoils the standard system (also great) for you forever. It is that good. Lexus has changed just about every part of this car line for the better. After seven model years it was a long wait, but worth it. What date will the 2014 IS models be at dealers? Lexus hasn't said yet, but we expect it to be May. Toyota and Lexus are very reliable that way. Press Releases and then cars 6 weeks away. Thanks for reading and for your question!